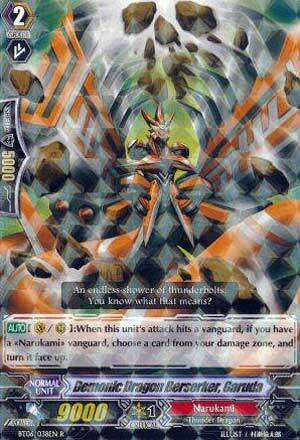 [AUTO](VC/RC): When this unit's attack hits a vanguard, if you have a «Narukami» vanguard, choose a card from your damage zone, and turn it face up. ...Garuda isn't exactly the most unique card in the game especially seeing how there's a variant of this in Gold Paladin (Mage of Calamity, Tripp) and even Granblue (Three Star Chef, Pietro), but there's a legitimate reason on why people use Garuda in almost every Naukami deck and Gold Paladins nor Granblue don't use their respectful I flipped units. It's mainly because Narukami are probably one of, if not THE, most Counterblast heavy decks, and the deck runs a lot better when there are more ways to flip the damage up, and Garuda does that pretty nicely. It a 9,000 power body, the I flipping effect and ability to intercept, Garuda definitely deserves a spot on any Narukami deck. Next time: Berserk Dragon! Get away from that thunderstorm!! !